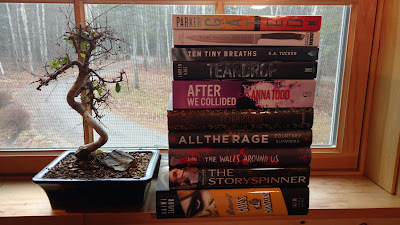 Stacking the Shelves is a weekly feature hosted by Tynga's Reviews. It is all about sharing what books you have added to your book collection recently! Many of you probably already know and participated in it but for those of you who haven't, Book Outlet had a massive black Friday sale where everything was 30% off. Of course I could not pass up that deal. I ended up buying 10 books + shipping for 28 dollars! Scroll down to see what books I picked up during this crazy sale! Did you buy anything during the Book Outlet Sale? OMG great choices! I love Laini Taylor and The Storyspinner was sooooo good. I have The Skylighter to be read. hope you enjoy all of your new books! I have heard so many things about The Storyspinner. When I saw it for such a good price on Book Outlet I knew I had to get it. You have got some great picks there! I try to not go to Book Outlet very often, I just don't need to spend the money if I can help it. :-) Have a great week! I am super out of the loop! Everyone is talking about "Book Outlet" and I've never ordered from there! Will definitely be checking in to it now. What deals! Great haul and I hope you enjoy your books! I discovered them last year.They have fantastic deals!